Who would have thought that scraps of fabric could make such a big difference? 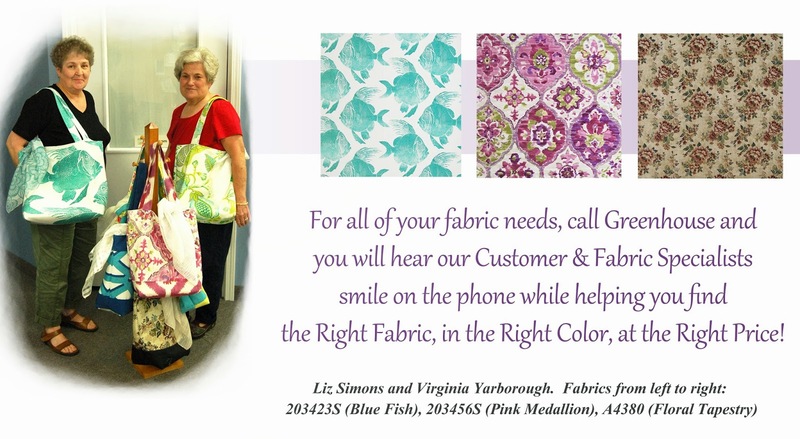 Each quarter, fabric vendors send us hundreds of samples eager for us to buy their fabrics. We choose the fabrics that make the most sense to our customers and feature them in our unbelievable collection of sample books. So what do we do with the hundreds of left over fabric samples? We donate them to local organizations and schools to use for special projects. High Point University, Carteret Community College, Westchester Baptist Church, Carriage House Specialties, and the High Point Quilt Guild are to name a few. When we started donating to the High Point Quilt Guild, we had no idea how much of a difference we would be making. Liz Simons, of the High Point Quilt Guild, participates in a program in which the guild makes charity quilts for the patients at the High Point Regional Cancer Center and with the leftover fabric they make one-of-a-kind tote bags. The tote bags are available in two different styles. One is a larger bag and is designed to hold the quilts for the patients. The other bag is smaller and has pockets. “Each patient who receives a quilt receives a bag. The patients just love them!” Liz explains. They sell the smaller bags in order to buy the batting for the quilts. When Liz brought the bags to show the Greenhouse employees, we loved them so much we bought twenty bags! “We were able to get enough batting from what we made on those bags to make 16 quilts for the patients!” Liz exclaims. “We really appreciate the fabrics. They are beautiful and make beautiful bags!” Since November of 2012, Liz and her associates have made a total of 121 quilts! Greenhouse is thrilled to be able to contribute to the joy these ladies provide the patients of High Point Regional Cancer Center.